Photograph of a young woman, possibly a graduation photograph, identified on the reverse as Louise Sawtelle. No studio imprint to give a clue as to locale. Because the photograph was found with a collection of photographs that contained several from the Mann family of Livermore Falls, Maine, this Louise might have been Louise Sawtelle, daughter of Harry W. Sawtelle and Mildred (Tibbitts) Sawtelle - Louise's mother Mildred would later marry James Wellington Mann. There was also the Louise Sawtelle who was Agnes Pauline (Bates) Sawtelle, "Louise", born July 10, 1898 at Dexter, Maine, wife of Earl Shepley Sawtelle. 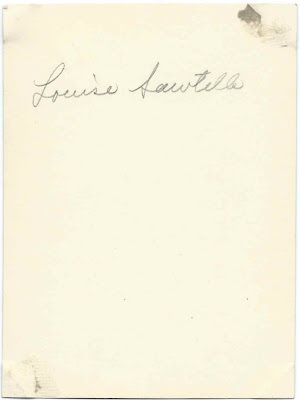 And it's very possible that the Louise Sawtelle in the photograph was not from Maine. 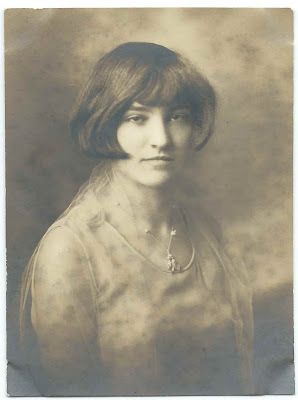 If you recognize the woman in the photograph from your family photographs and research, or if you have corrections to information presented above, please leave a comment or contact me directly.